The TRT is a collection of four transducer trainers which include Optical, Temperature, Strain gauge and LVDT. The four different trainers help teach students an introduction into various elements of transducers. The strain gauge trainer uses a cantilever beam arrangement to produce strain on the strain gauge with weights placed on the free end of the cantilever. The seven-segment LED display shows strain in micro strain units. Different weights are provided to perform linearity and sensitivity experiments. The Optical Transducer comprises of various sensors and transducers which provides the basic knowledge for sensing light and signal conditioning of the signals received from the sensors and transducers. 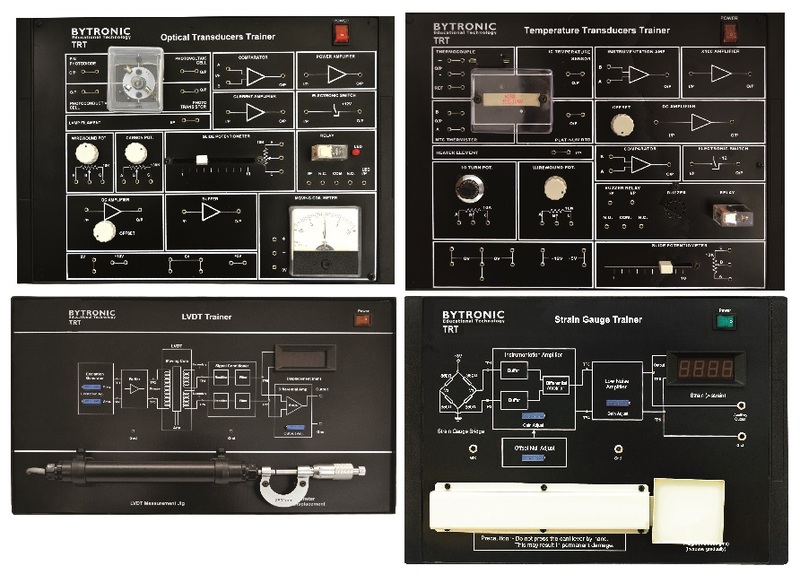 The Temperature Transducer trainer covers four different types of transducers. Experiments covering fundamental characteristics of transducers and the study of transducer controlled switching/alarm systems can be performed. The LVDT (Linear Variable Differential Transformer) is the most widely used inductive transducer for displacement measurement. LVDT is a secondary transducer which converts the displacement directly into an electrical output proportional to the displacement. The trainers seven-segment LED display shows displacement in mm with a sensitivity of 10mV/mm in the range of 10mm.